Cholesterol is a type of fat in the blood. High cholesterol is when there is too much of this fat. Low density lipoproteins (LDL) are known as bad cholesterol because they cause fats to build up in blood vessels. 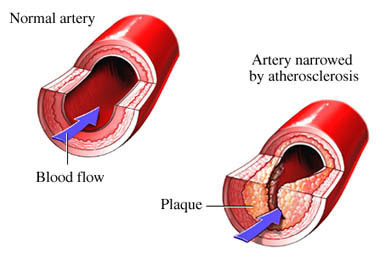 High levels can cause diseases of the arteries and heart. High density lipoproteins (HDL) are known as good cholesterol because they can remove fats from the blood and protect against disease. High cholesterol increases your risk of stroke and heart disease. The risk of high cholesterol increases with age. It is more common in men. It is also more common in women after menopause. High cholesterol does not usually cause symptoms. However, it can increase your risk of atherosclerosis. This can block the flow of blood with a fatty buildup known as plaque. Cholesterol deposits may also form in tendons, under the eyes, or in the eye. Some people with high cholesterol may also have cholesterol deposits in tendons, under the eyes, or in the eye. Cholesterol screening is done as part of your regular exam. You will be asked about factors that may increase your risk of heart disease or stroke. Balance the calories you eat with the calories you use through physical activity. This will help you reach or maintain a healthy weight. Eat a diet that is high in fruits and vegetables . Include foods that are whole grain and high in fiber . Consider drinking green or black tea. These teas have been shown to help reduce cholesterol. If you drink alcohol, drink in moderation. This means no more than 1 drink per day for women and 2 drinks per day for men. HDL removes fat from the blood. You can raise your HDL through activity. Talk to your doctor about which exercise program is right for you. Smoking lowers HDL. If you smoke, talk to your doctor about ways to quit. Excess weight raises your LDL and lowers your HDL. If you are overweight, talk to your doctor about ways to lose weight safely. Treat and control any other medical conditions you have, such as high blood pressure and diabetes. Statins are a medicine that may help lower your cholesterol and reduce your risk of heart attack and stroke. Statins work best when you also eat healthy and exercise. They should not be used in place of healthy lifestyle changes. To help reduce your chances of high cholesterol, follow the lifestyle and diet changes above. Some cholesterol issues are due to genetics. These are harder to prevent. Many are linked to diet and lifestyle. Changes to these can help reduce your chances of high cholesterol. Cholesterol. American Heart Association website. Available at: http://www.heart.org/HEARTORG/Conditions/Cholesterol/Cholesterol%5FUCM%5F001089%5FSubHomePage.jsp. Accessed March 26, 2018. Hypercholesterolemia. EBSCO DynaMed Plus website. Available at: http://www.dynamed.com/topics/dmp~AN~T114250/Hypercholesterolemia. Updated March 5, 2018. Accessed March 26, 2018. 12/14/2009 DynaMed Plus Systematic Literature Surveillance http://www.dynamed.com/topics/dmp~AN~T115449/Dietary-considerations-for-cardiovascular-disease-prevention: Ferdowsian HR, Barnard ND. Effects of plant-based diets on plasma lipids. Am J Cardiol. 2009;104(7):947-956. 8/27/2013 DynaMed Plus Systematic Literature Surveillance http://www.dynamed.com/topics/dmp~AN~T115449/Dietary-considerations-for-cardiovascular-disease-prevention: Hartley L, Flowers N, Holmes J, et al. Green and black tea for the primary prevention of cardiovascular disease. Cochrane Database Syst Rev. 2013;6:CD009934.